Normal mission: Find Professor Gerald's laboratory! 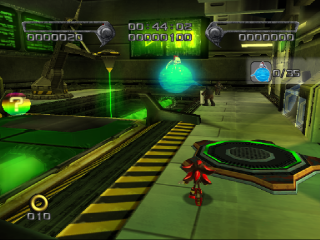 Lost Impact is one of five possible fifth levels of Shadow the Hedgehog; in the game's branching path structure, it follows from taking a highly heroic, GUN-aligned path through the previous levels. Like The Doom, this level takes place in Shadow's memory, transporting the player back to the halcyon days of the Space Colony ARK. The hedgehog's early life with Maria and Gerald Robotnik is crudely interrupted by a security breach freeing the Artificial Chaos from the confines of Project Shadow; Shadow and his human friend must make their way across the facility on weaponised monorails in order to seek refuge. Depicting the ARK during its peak, Lost Impact has fully functioning monitors with maps, data, and information on the 'levels' of the research lab. Lost Impact has tons of beeping machines, laser maintenance drills, laser defense orbs, electric barriers, and elevators. The most interesting feature is the G.U.N. Lift, which Maria states was designed only to be used in an emergency, which suggests that someone predicted these events. There are also large blue neon light fixtures that can be broken and utilized as melee weapons. As in many of Shadow's "Defeat x enemies" missions, hunting down all 35 Artificial Chaos in the labyrinthine confines of the level can be an exercise in frustration, especially as several float almost out of sight along the G.U.N. Lift routes. After assisting Espio the Chameleon to hack Dr. Eggman's Mad Matrix, or helping Rouge the Bat clear the Black Arms out of the Death Ruins, Shadow comes out of a Chaos Control in Iron Jungle, to spot Sonic standing on the wing of Tails' new spacecraft. Sonic informs Shadow that the Black Arms are on their way to the ARK, and the black hedgehog agrees to follow them. However, during the spaceflight, Shadow finds a capsule containing the ship's power source: the cyan Chaos Emerald. Making a comment that it's "like taking candy from a baby, which is fine by me", Shadow decides that gathering the Emeralds for himself is the most pressing priority, and breaks the capsule. The Emerald's energies, combined with the ship's alarm's siren, together trigger a memory from Shadow's past which he slides into: Maria coming to Shadow (who was in the research lab at the time) and telling him that "something's gone terribly wrong with Grandfather's experiments". Maria recruits Shadow to stop the 'monsters', which are the rampaging Artificial Chaos. Shadow can agree and hunt down the gelatinous blobs with the GUN forces, or make a beeline straight for the Professor himself, to verify the old man's safety. While never made entirely clear, it seems that this incident is entirely distinct (and preceding) from the eventual G.U.N. attack on Project Shadow depicted in The Doom. Lost Impact has the G.U.N. soldiers fighting with Gerald's staff to suppress the Artificial Chaos. If this is the case, Lost Impact may be the second research malfunction to threaten life and limb on the ARK; the first being Emerl the Gizoid's rampage recounted in Prof. Gerald's Journal (Sonic Battle). From the third checkpoint, enter the door at the far end of the room. Go through it and the door behind it. Go to the left and through the hole in the wall. Turn right and go through the two doors, and go left, again through two doors. Go to the left once more and up the pulley ring. In the room with the sixth checkpoint, Maria makes a comment about the experiments looking cute when they break apart.